Whatever you want to do in life or in business, having a plan usually has a positive impact on the chances that your actions will produce the desired outcome. When you have a new idea for your company, coming up with a good plan for it is always the best way to start. Let’s take social selling, for instance. 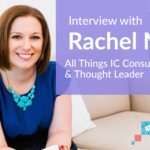 This customer-centric selling strategy has become one of the hottest topics in digital communications, and rightly so. Studies show that sales reps using social media as part of their sales techniques outsell 78% of their peers (Forbes), and as many as 81% of buyers are more likely to engage with a salesperson who has a strong professional brand online (LinkedIn). As intrigued as organisations are by the promises of social selling, many of them are not doing much about it. In fact, 2 out of 3 of companies have no social media strategy for their sales team whatsoever. Other organisations have a slightly different approach. They are interested in social selling, but think that a one-hour training with their sales team about LinkedIn and Twitter will be enough to create a routine and start seeing results. 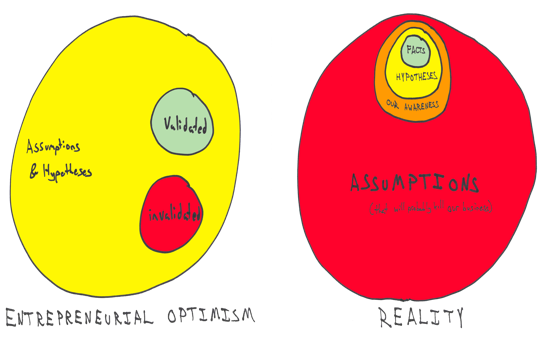 This is a typical example of entrepreneurial optimism crushing against reality. To ensure the success of your social selling programme, your best bet is to spend a little bit of time coming up with a plan for your company, and then follow it. At SoAmpli, we have been helping our enterprise clients with their social selling implementations for the last two years. The result of our extensive experience is a clear step-by-step guide (below) to help companies implement social selling in the most efficient and effective way! 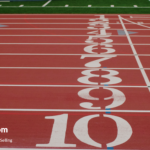 You have come to social selling for a reason. What is it? What do you want to achieve with it? Whether it’s all about increasing sales people’s social media confidence and frequency of sharing, or filling your pipeline faster, you should have clear from the start what success looks like and how you are going to MEASURE it. Whether it’s traffic to your commercial web pages through Google Analytics, number of leads added to your CRM system, or increased engagement with re-purposed marketing content, it’s good to put an analytic framework in place. In my experience it is very likely that your objectives may change as the programme evolves and you identify more best practices. This is not a problem at all, as long as you adjust your KPIs along with the objectives. To make the most of your social selling programme, you need two things: good content, and consistency. Marketing team’s expertise usually includes knowing how to curate and package content to drive engagement, and a good social selling programme should leverage this. If you are planning to use a social selling platform at your company, identify who, within your marketing team, will be in charge of importing content into it for sales people to share. This is not a hefty task, but one that needs to be done on an on-going basis for best results. On the other hand, within your sales team, select which colleagues you’d like to get involved in the programme from the beginning. You wouldn’t expect someone to know how to drive if they had never seen a car before. Similarly, it is easier to avoid social media “crashes” when good training is provided before someone starts posting or tweeting. When you present the initiative, it is important you are very clear in explaining what you mean by social selling. Focus on short and long-term objectives and explaining the programme’s benefits for individual members of the sales team. You should also support your colleagues in sales by organising on-site or online training and providing advice on social media best practices. Your marketing team should also identify and make available the most powerful pieces of content within your existing company’s marketing directory that can serve as ammunition for the sales team to engage relevant prospects and existing clients on social media from the get-go. 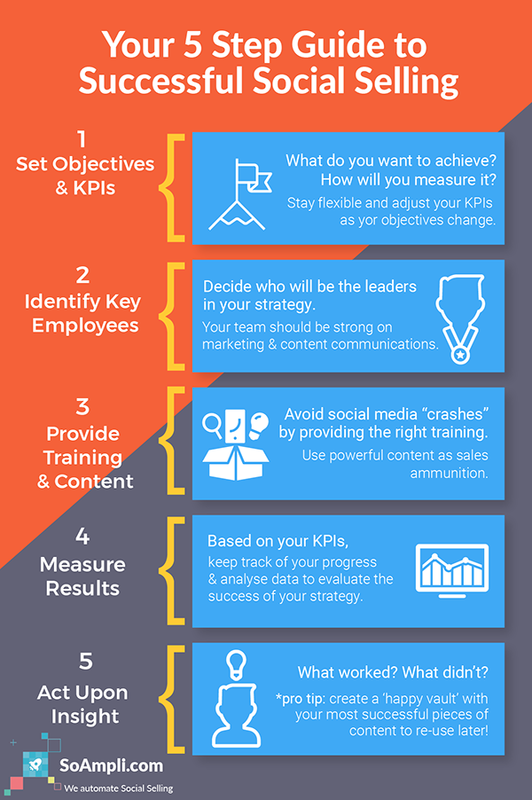 Based on the KPIs you have set at the beginning of your plan, keep track of your progress and analyse engagement data to evaluate the success of your overall strategy periodically. When using a dedicated platform like SoAmpli, you can quickly gather unique insight into which content your sales team like to share on social media, as well as which formats and topics are generating the most clicks, likes and traffic to your company’s website. This is all available in one place, meaning you can measure results quicker and easier. Once you’ve gathered relevant statistics, it’s time to do something about it. Specifically, what worked? What didn’t? This learning will help your marketing team plan even more effective future content, building a “happy vault” of best-performing posts, themes, images, videos, etc. Through “snackable” reports and quick tips, this learning can be shared with members of the sales team on a weekly or monthly basis to achieve education and training on the go. 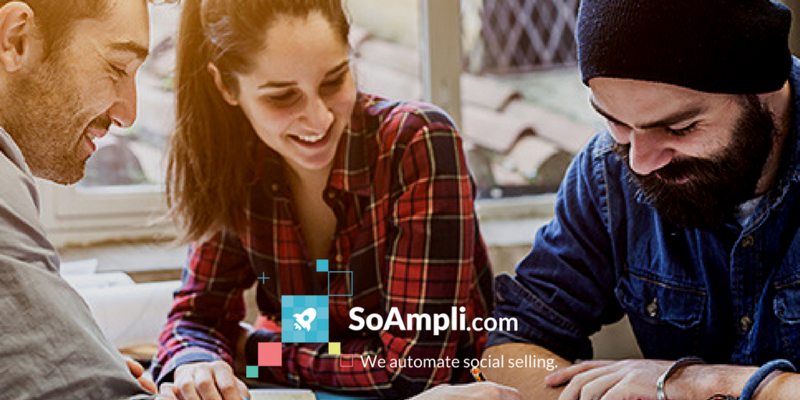 At SoAmpli, our expertise lies in helping clients implement social selling in the most effective and efficient way. Intrigued? Ask us for a demo and let’s see what we can achieve together.